So which firms can now look to the future with some optimism? This echoes my own thoughts. But we also need to be clear about what ‘can't stay still’ actually means. I have talked before about the need to keep up with technology, social media etc, and that is all extremely important. But firms who realise that they can’t stay still need to have some idea where they are going! One of my favourite Monty Python Sketches is the One Hundred Metres for people with no sense of direction. The athletes line up with real focus and dedication. When the gun goes sounds, they all head off in different directions. Those law firms which have a clear direction are those which will come out this the strongest. So one obvious question will be – what are best at? In what areas of work do we meet the needs of our clients? So if a firm is particularly strong in say Clinical Negligence or Employment Law, then they should concentrate their efforts there and do all that they can to build on that strength. Any obstacles need to be faced and overcome. We all know that the Government is making it more difficult to pursue compensation claims, so this mean might mean a change in the way we work. Some tasks might need to be outsourced and some tasks that we send out to other agencies might be more effectively done in-house. Changes can be painful and difficult but the status quo is not an option. The arrival and growth of Alternative Business Structures can be an opportunity as well as a threat here. Many firms have relied on buying personal injury cases from Claims Management Companies. That model is certainly not going to continue in its current form once the payment of such fees is banned in a few months time. Those firms who just stand still and wait – are likely to end up like a rabbit caught in headlights! Those who look to develop new partnerships and marketing initiatives will not only survive but thrive. So firms do indeed need to move but also need to head in a clear direction . One Direction may be a crap boy band but there is something in the name!! 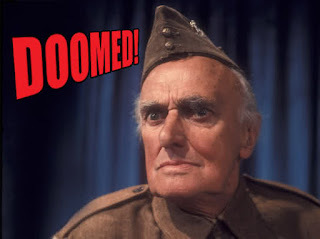 Well I go on holiday for a week and return to the news of one major commercial law firm going into administration and other massive names making cuts. One of the biggest firms to get into difficulties is Cobbetts who have gone into Administration. They employ over 550 staff almost half of whom are qualified lawyers. They were well established in commercial litigation, especially Agency Disputes which is an area in which my own firm has many cases. The news is a big shock to many of us as they had a strong reputation and were recently close to a merger with well known lawyers DWF. This development comes on the back of news that mega firms, Eversheds, DLA Piper and Allen and Overy are all cutting staff. In all of my 30 years as a Solicitor I have never known so many casualties as the deepest recession that we have known continues to hit firms who seemed unsinkable. But despite all of this there is scope for optimism. The practice of law is changing but it will still continue. It may continue in a way that is unrecognisable to many of us but lawyers who embrace the change are likely to become stronger. So who are they? I think we will see many different initiatives from more imaginative lawyers – such as those who thought of offering legal services via the Eddie Stobart brand or those offering business advice via an annual fixed fee. I have gone on at length about the need for firms to develop social media connections and communicate with clients in the real world! The days when clients came back to their ‘family firm’ have gone. The days when certain safe areas of work guaranteed a nice living have gone. Firms who cannot or will not see that are in for a rough time. But for others it is a time that will present opportunities. The underlying legal issues will not go away. Neither will those law firms who plan their response to change. This is in relation to proposals by the Ministry of Justice to increase the small claims limit for whiplash cases to £5,000 thus taking most of such claims outside legal representation. Straw has called for this to be applied across all Personal Injury cases. It is difficult to imagine a more ill conceived statement. All sides need to work together to eliminate such cases. But the vast majority are genuine and honest victims. How on earth will that figure be reduced by making it harder for them to get justice? And how will the courts deal with serious allegations of fraud via the Small Claims court which is really designed for straightforward consumer disputes? As soon as fraud is alleged the case would be taken out of that court in any event. What is worrying is that Mr. Straw is a high profile figure and his comments, however bizarre, are widely reported and add to the myth that it is victims of accidents who are responsible for higher insurance premiums. The news that HMV has gone into Administration marks the end of an era. But equally I have to confess that most of my music these days comes from iTunes or Spotify and I am struggling to remember the last time I bought a CD. This is due to the decline in Video/DVD rentals. Now in a recession which is as deep and enduring as any I have ever known, closures are to be expected. But these particular failures demonstrate more clearly than anything that the world is changing at a staggering pace. Businesses who adapted well to the changing world of the 20th Century are the casualties of the 21st. Clients are unlikely to instruct particular lawyers because they have always done so. After April 2013 they will no longer be able to rely on buying work from referrers. There are areas of work which are highly specialised and clients will look for the best. Where will they find them? Google. I don’t book a holiday destination without visiting Trip Adviser. How do people communicate? They use social networking sites. Twitter and Facebook are becoming mainstream, and not just the domain of the young. If only 5% of clients want to receive traditional letters why do so many of us spend time and money stuffing envelopes rather than sending emails? This is an opportunity for lawyers to take advantage of the changing world and to become modern thriving businesses. Change can be a threat but it can also create opportunities. I suspect that we will have a very different legal profession in ten years time – although I might be doing the Virtual Gardener Blog by then! Clinical Negligence cases can be amongst the most demanding and distressing. Victims include children born with catastrophic brain injuries who will be dependant of care and assistance for the whole of their lives. We often read press reports of damages in millions of pounds. Whilst these might seem like lottery wins they normally cover the basic care that a victim will require for life. It has been the case for many years that claimants are entitled to be paid the cost of private care. This is because they have the need for such care through no fault of their own and are entitled to have those needs met by their compensation rather than through the general NHS budget. The type of available care has improved over time. Victims live longer. There seems to be an increase in medical incidents. As a result of all of these factors the cost of care has increased. Their argument focuses on the cost to the NHS of having to pay out such huge amounts. But one suspects that they have their own agenda here. Like any other insurer they want to reduce the cost of claims. But their argument is misconceived. If a person suffers a life changing injury through the fault of another then they are entitled to be compensated, including the cost of medical and other care for as long as necessary. This is not limited to medical cases. If a person becomes paraplegic following a car accident which is another motorist’s fault then their care is paid for by that driver’s insurer. If somebody loses a limb because it becomes trapped in an unguarded machine at work then the employer’s insurer pays. Why should a victim be at a disadvantage just because their life has been ruined by a doctor? The principle has to apply across the board. If the Medical Defence or the NHS Trusts want to see a real reduction in claims then they should focus on taking steps to reduce the risk of such incidents happening in the first place. We must get away from this rhetoric of blaming victims for the cost of such claims. I have never acted for a victim who would not swap all the money in the world for a better, or any in some cases, quality of life. There are many reasons why those from lower income families might be deterred. Who would want to run up eye watering levels of debt and have no guarantee of a job at the end of it all? The Legal Profession is under greater political pressure than at any time that I can remember. It is encouraging to read of the actions taken by these mega firms to ensure that the best students are attracted to the law regardless of their background. She also refers to the work done by the PRIME initiative offered by a group of firms. These projects are certainly good news and hopefully more firms will follow suit. We need to see action taken to attract those lawyers who see a career in the law as a calling to fight for justice. There is a limit on what the legal profession can do. I suspect that we will see increased numbers opting for apprentiships rather than formal legal qualification. There will also be more students aiming for Legal Executive status especially following the grant of the Charter to CILEX. But there will still be those who want to become a Solicitor or Barrister and it will be a shame if that door is closed to those who are not rich or do not want to work in the City of London. From April 2013 it will no longer be lawful for Solicitors’ firms to pay referral fees for Personal Injury work. Referral Fees have only been acceptable since 2004. But since that time an entire industry has grown. We have seen the arrival and growth of major Claims Management Companies (CMCs) who have used their marketing strength to find cases which they have sold on to law firms. In turn, some law firms have become major players in the Personal Injury field by buying in massive volumes of work. The full impact of the ban is yet to be assessed. It seems clear that many of the biggest CMCs will set up joint business ventures with firms as Alternative Business Structures (ABSs). But what is clear is that any business model based on buying in as much work as a firm can afford is finished. So how will Personal Injury solicitors find work after April? I suspect that many will simply abandon ship and look for other ways of making money. We will see the development of mergers and networks as firms look to consolidate and use collective marketing. The internet is also going to play a more significant role as forward thinking firms plan their own marketing. Who doesn’t use Google to find a service? So firms will be looking to do all that they can to strengthen their position in the rankings. Being on the first page of Google can be worth a fortune and the role of SEO is going to become extremely important. I bet that most lawyers did not know what that acronym meant until a couple of years ago. As of today LinkedIn tells me that my network of contacts has a potential reach of 8,690,641 – about the population of Austria. The potential is almost limitless. It is hard work but likely to be the way forwards. Those well known names are bound to draw attention. But ultimately clients want the best advice. This will focus the minds of all lawyers and will hopefully result in better quality across the board. I have to confess that I would not be the best patient in the world – especially if surgery was involved. It is probably due to having been involved in cases over the last twenty years in which I have come across most of the things that can go wrong! So you are unlikely to find me in any theatre other than one where a far more harmless drama unfolds, unless it is absolutely necessary. But seriously, surgery is serious business. Things can go wrong, even with the greatest of care in the world. Patients should be fully aware of the risks involved. Surgery does not become less risky just because it is described as ‘cosmetic’. The use of invasive treatment to improve appearance has become big business over the last few years. As a result there has been a bigger emphasis on the ‘sale’ than on the patients’ safety. Those patients include the most vulnerable, who are desperate to improve their ‘look’. It is not uncommon for somebody to be seen by a sales rep rather than a doctor prior to agreeing to a procedure. There are even reports of deals being offered to encourage surgery including buy one get one free. This scandal has been highlighted over the last year by the PIP implants involving thousands of women in the UK who were given potentially faulty breast implants which carry a high risk of rupture. Whilst surgery has to be carried out by a doctor there are many other procedures which do not and which still carry risks. In addition patients who will do anything to achieve what they believe will be a better appearance, are consenting to procedures without being fully aware of the dangers. Two important recommendations are for a two stage consent process to soften any sales pitch and the fairly obvious requirement that a person be seen by a doctor and not a salesperson. The well known GP Rosemary Leonard correctly spells out the problem – “Surgery – indeed any cosmetic intervention – is a serious step and a patient must be told about the immediate side-effects after surgery as well as any potential long-term effects on their health." These suggestions will certainly assist. But I suspect that far tighter regulation will be required. It is a sector which seems to have gone out of control. I have seen the damage that can be done when surgery goes wrong or when expectations are falsely raised. It is not good enough to be able to sue somebody after the event. The damage is done and money is little comfort. I hope that this report is beginning of the end of the end of surgery as part of a ‘cosmetic industry’. We made the point that the discussion paper gave no hint as to the basis on which the cuts were calculated and appeared to be unrealistic and apparently based on rhetoric from insurance companies. The reply had to be rushed as the response time was due to expire on 4th January. Thankfully, the last job of the year was to read the news that the plans had in fact been shelved. This followed legal action taken by APIL and MASS arguing that the proposals were unlawful. At the last moment before the break the Lord Chancellor Chris Grayling, who is not himself a lawyer, conceded the point. Whilst this is good news for lawyers acting for ordinary people it is probably only a delay. The government seem determined to press on with its relentless attacks on the legal profession on behalf of the insurance industry but it is to be hoped that some sense will prevail when the plans come back. It will probably also result in an increase in the amount of free work done by lawyers. These have been popularly known as TESCO law models as High Street names move into the Legal Services Market. But it will also see the growth in partnerships between traditional law firms and outside suppliers of work. Many firms have built their businesses on the basis of buying cases from Claims Management Companies. That model will end when referral fees are banned in April. This will open up a market for work and this will be a real opportunity for these new style businesses which are to combine legal expertise and commercial experience. So it is certainly not going to be a quiet year.